Our undergraduate offerings include courses that develop students' ability to write high-level research essays, and courses designed specifically for non-native speakers of English. MWC graduate-level courses cultivate mastery of oral and written communication for scholarly purposes. The MWC offers a variety of non-credit courses that teach writing skills for different media and professional contexts – all open to the public as well as members of the McGill community. Routes of Writing gives insight into the writing practices of McGill academics, with professors and librarians from across the disciplines offering their reflections on writing processes and critical thinking. Welcome to the McGill Writing Centre! 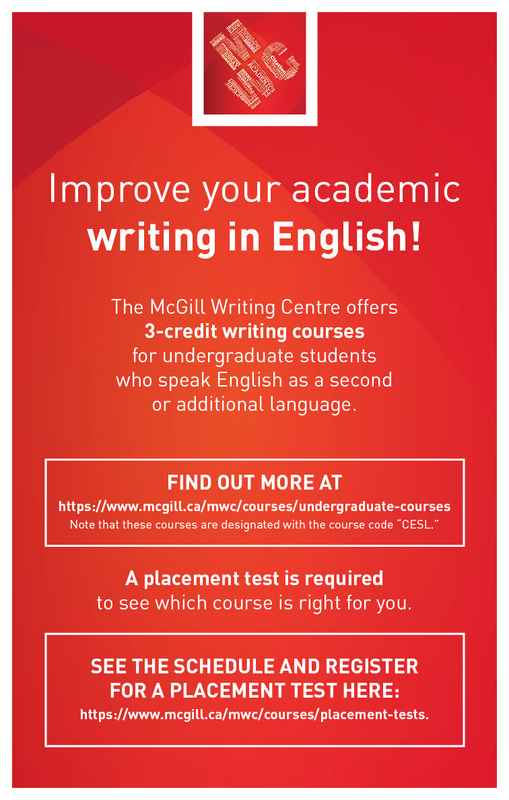 Refine your academic writing skills or learn to write for a specific professional audience with courses offered by the McGill Writing Centre (MWC). As a student in one of the MWC’s courses or workshops, you'll learn essential skills, strategies, and techniques that will help you to succeed both at university and in any number of professions. The administrative offices are closed from 12:30 p.m. to 2:00 p.m.
Tutorial Service hours can be found here. Check the schedule for the placement tests in 2019. Check out our new elective course for undergrads! Learn more about the Communicating Science course by reading this interview with Diane Dechief, designer of this course.